Richard Holton Cracroft was an English professor and author noted for his contribution to Mormon literature. In 2000, he was honored with a lifetime membership in the Association of Mormon Letters; he had served as its president. in 2011 he received the Petitt-Smithe Award for Outstanding Contributions to Mormon Letter. Cracroft was born in Salt Lake City on June 28, 1936, and graduated from East High in 1954. He earned his bachelor’s and master’s degrees in English from the University of Utah and his PhD in American and English literature from the University of Wisconsin-Madison. He taught at both the University of Utah and the University of Wisconsin and joined the faculty at Brigham Young University in 1963 where he stayed until his retirement in 2001. While at BYU, he was chair of the English department, dean of the College of Humanities, coordinator of American Studies, director of the Center for the Study of Christian Values in Literature, editor of Literature and Belief. He received BYU’s Abraham O. Smoot award and was the first holder of the Nan Osmond Grass Professorship in English. With Neal Lambert, he was the editor of the first anthology of Latter-day Saint literature entitled A Believing People. 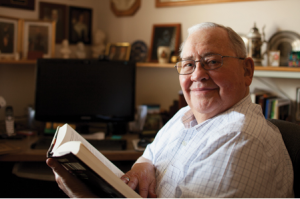 For over twenty years he wrote a book review column, “Alumni Book Nook,” for Brigham Young Magazine, retiring in 2011. He published extensively on American, Western American, German, and Mormon literature, and biography. He authored and edited eighteen books. He compiled five volumes of The Collected Writings of Richard Holton Cracroft in 2011. He read for 30 to 90 minutes every night. He married Janice Marie Alger on September 17, 1959. They had three children. As an active member of The Church of Jesus Christ of Latter-day Saints, he served as a missionary (Swiss-Austrian Mission from 1956–1959) bishop, stake president, and mission president (Switzerland Zurich Mission from 1986-1989). He died on September 20, 2012. This page was last edited on 28 February 2015, at 19:33.